Hive splitting is best done in May or June in our area. Here is some really good information about hive splitting methods from a beekeep in Alberta, Canada. Every month, we will add a suggested checklist of beekeeping responsibilities for the current month specific to our area. There are also links to other bee club calendar sites. And remember to keep track of your hives/hive inspections on the Hive Tracks site. Here is a link to the Kentucky Beekeeper’s Calendar that was written by their Apiculture Extension Specialist. It has quite a lot of useful information. Clear snow from entrances and check if winter emergency feeding is needed. Take this time to repair and build new hives and attend bee club meetings. How do Honey bees keep warm? See this article on Heater Bees! Get your bees ordered this month. Keep the snow cleared from the hive entrance. Check if winter emergency feeding is needed. Monitor cluster with stethoscope. There are various feeding techniques. See the Honey Bee Suite blog where the author has a ‘minimalist guide to winter feeding’ for ideas. Clear snow from hive entrance. Check if winter emergency feeding is needed. Peek inside on a warm, calm day. Apistan strips if desired. You can start feeding light syrup (1:1) 19 days ahead of first pollen to give the bees a jump-start. The weather is improving and early blossoms begin to appear. The bees will begin to bring pollen into the hive and the queen is busily laying eggs; the population will grow fast. Drones will begin to appear. On a warm, still day — do your first comprehensive hive inspection. Scrape the bottom board and check for brood pattern. Is there evidence of a queen? Are there plenty of eggs and brood? Add mite control if needed. If there is sufficient brood, split colony. Pollen.com and PollenLibrary.com both allow you to enter your zip code to get a report of plants flowering in your area — including trees, weeds and grasses. IMPORTANT WARNING – No treatments should be done when honey supers are on and you must not use honey from the brood boxes/hive bodies that were in place at the time of the treatment. It IS good honey for the bees’ consumption, however. Install newly purchased colonies and feed them until they have drawn ou the comb in their brood chambers. For existing colonies, check for evidence of brood disease and Varroa at the beginning of the dandelion bloom. Apply mite treatment and requeen failing queens as necessary. Your bees should be very active and pollen should begin to come into the hive thick and heavy. The queen will be reaching her greatest rate of egg laying and your hive should be bursting with activity. Manipulate the frames if ncessary to aid in comb construction. Check your hive for honey and add a queen excluder and place new supers as necessary. Keep an eye out for swarming — inspect your hive weekly if desired. This is also the time to consider hive splitting — see the April, 2011 Meeting Minutes for more details. Remove mite treatments and antibiotics per label instructions. This is the main honey-flow season so the colonies should be full of bees working hard filling supers. In our area, the queen lays most of her from May through August. Inspect the hive and add honey supers as needed. Watch for indications of swarming. During hot/humid evenings, you may see a huge beard of bees cooling themselves on the exterior of the hive entrance. This is normal and is actually called ‘bearding’. Nectar flow will end this month and the growth of the colony starts diminishing. Drones are still around but outside activity slows down as the nectar flow slows. Watch for honey robbing by wasps and other bees. Be careful opening the hive for extended periods of time as it may prompt robbing. Assure the queen is present and add apistan strips and mite treatment if necessary. Start feeding heavy syrup (2:1) as honey flow dwindles and monitor for robbing by wasps and mice. Unite weak hives and position brood and honey stores in anticipation of winter. Inspect hive on a calm over 60 degree F day. Monitor for robbing. Add mouse guard if desired. Estimate honey stores and harvest honey as preferred. Setup a wind break and winter protection as desired. Continue feeding bees if needed. Few bees? No brood? See this link from Honeybee Suite. Winterize your hive through your preferred method. Some members use 2” Styrofoam (allowed to air out for a few weeks) around three sides and the top of the hives; others use straw (or hay) bales around 3 sides and on top; some wrap the hives in tarpaper. Whatever method you use, ). Some use tarpaper. The most important issue is keeping condensation low by having good ventilation and keeping the bees dry. Put a mouse guard at the hive entrance. Monitor cluster with stethascope. Store toos and equipment for the winter. Catch up on all the bee news articles and web site links and attend bee club meetings. New post from Tom Allen (November 2, 2016) – from Honeybee Suite – hives have no brood, what should I do. Also posted under Beekeepers Calendar. Keep snow from entrance of hive. Monitor cluster with stethascope. Develop plan for next year. Repair and build hives. Attend bee club meetings. Granulated Sugar or Drivert Sugar (see October, 2011 Meeting Minutes) may be used for winter feeding. The sugar is fed dry and inside the hive. The South Dakota State Flower is the Pasque Flower which blooms in late March. 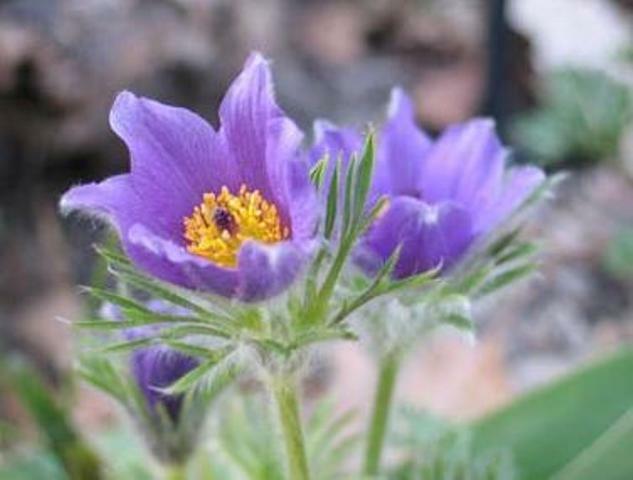 Honey bees and other pollen gatherers depend on the Pasque Flower to replenish their food stores after our long winters. Here is some information given to Jerry and Pat from Linda Zenner. Linda found this information in Michael Pollen’s book, Omnivore’s Dilemma. “To control pests every six or seven strips of lettuce is punctuated with a strip of flowers: sweet alyssum, which attracts the lacewings and syrphid flies that eat the aphids and can molest lettuces.” Honey bees also love sweet alyssum. See this site for a detailed list of ‘Companion Planting‘ that discourages harmful pests in your garden while providing for your honey bees. For example, planting ‘Borage’ with tomatoes, squash, strawberries, etc. discourages tomato hornworms and cabbage worms while being one of the best bee attracting plants. Peppermint repels while cabbage mtho and aphids while attracting bees. Here is another site that discusses ‘Companion Planting‘. Here are some interesting articles on gardening and bees.